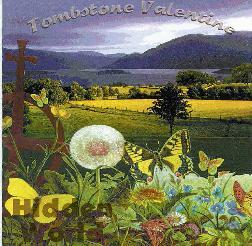 Tombstone Valentine - "Hidden World"
The CD reissue of Tombstone Valentine's debut vinyl LP is partly a brand new release. The six tracks include three of the vinyl's four tracks ("Triple O Shuffle" is left off) plus three new tracks. The band play an exciting brand of early freeform Krautrock influenced space, but with a fresh and exciting approach. The band consists of Diane Hancock on Farfisa, synth, hand percussion, and vocals, Randy Schwartz on violin, e-bow, and bass, Greg Toombs guitar, and hand percussion, Richelle Toombs on Farfisa, synth, hand percussion, and lead vocals, and Rick Wilkerson on bass and rhythm guitar. The music has that great exploratory feel reminiscent of bands like Amon Düül and Can, as well as the best of the psych explorers. The Farfisa on "Green Sky Night" is MOST welcome and Richelle Toomb's vocals give the music a kind of performance artsy feel. "Somewhere, Here" could well have been an archival track from Berlin in 1970, but is indeed Tombstone Valentine in the late 90's. The guitars wander and explore in the trippiest of fashions while the bass provides a plodding backbone and the synths embellish the music with classic experimental electronica. Forget structure... this music is pure exploration. And speaking of Krautrock and exploration... "Krautrock In Three Parts" is an 18 minute space epic! The tune opens with a simple but gorgeous Farfisa line, a background drone, slowly tripping guitar, and a cosmically ascending/descending synth. The band soon goes into what must be pure improvisation with each member strumming, plucking, and banging to produce a space-psych experimental heaven. A true return to the days of the pioneers. "Devotion" has a freaky Middle Eastern psych feel and Richelle's vocals create a pleasantly eerie atmosphere. She has a wonderful voice and the acidic guitars and organ that back her make for a really liquid psych experience. The rest of the disc is similar and further demonstrates Tombstone Valentine's comfort with improvisational space explorations of the more purely freeform sort. Highly recommended to fans of early Krautrock and adventurous psychedelia. You can visit Tombstone Valentine at their web site. For information on obtaining the CD, visit the Aether Records web site.